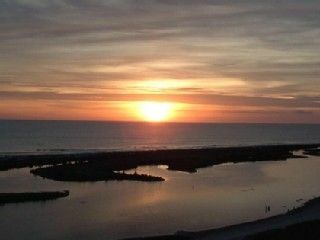 Enjoy the warm Florida sunshine on Marco Island located just 50 minutes south of Fort Myers. The remodeled 2BR/2BA condo can be your home away from home - just bring your shorts, sandals and suntan lotion. We are located on the 14th floor in South Seas Tower IV. This beautifully maintained gated complex offers 24 hour security, swimming pool, tennis courts, fitness center, high speed wireless access in lobby, washers and dryers and boat docks. The master bedroom has a king bed, the guest bedroom has aqueen bed and the living room a queen sofa sleeper. The kitchen has completely new countertops and appliances. Indulge in the awesome sunsets on the large private balcony. We are directly on the 3.5 miles of white sands of Tigertail Beach perfect for walking, running, shelling, and bird-watching. We offer beach chairs, towels, and toys for your convenience. The area offers all kinds of water sports, fishing, golf, theater, shopping, playground and outstanding restaurants. A gated complex with 24 hour security located directly on Marco's white sandy beach. Fully stocked kitchen with microwave, dishwasher, stove/oven, refrigerator, toaster, can opener, coffee maker, etc. We have provided all linens/towels, beach chairs, beach towels, beach toys, books, 2 TV’s with cable, DVD in living room, and private balcony. Wireless internet available in the unit. There is covered parking, a heated pool, an exercise room (located in Tower 3) and washers/dryers (located on the same floor - $5, $10, or $20 'Smart Card' available).Ten tennis courts and boat docks are available to rent on premises. Collect shells and enjoy the sunshine and great sunsets (we face west). Take advantage of water sports (jet skiing,parasailing, etc) available for rent along the beach, golf, boating, fine restaurants, shopping, and entertainment. Just off the island are factory outlet stores. Naples is 20 miles north and offers more dining, the Coastline Mall, miniature golf, Naples zoo and much more. I love the beach. Bought property with a generous inheritance from my parents (they loved the beach too!). I am a former elementary teacher. Currently I foster kittens for an animal shelter until they are ready to be adopted and love it. My husband is an electrical engineer - self employed. We live in Shawnee, KS a suburb of Kansas City. We have 3 adult children - 1 daughter(speech pathologist),1 son (industrial engineer), and 1 son with and MPH working for the Kansas Cancer Center. We also have 3 grand children currently 2 years, 4 mos and 5 mos. Sourh Seas is at the beginning of condos and hotels on the island - semi private - less traffic - closer to stores and restaurants, We use this as our second/vacation home so like to keep things in excellent condition. Remodeled twice - repair/replace/update each time we are there. Romantic - my son-in-law proposed to my daughter here. I love beach decorations and colors - hard to get away with in Kansas. Lots of rental competition but I think it is fairly priced for a clean,efficient,and kick-back condo. Private and can't beat the view..
Master Bath Shower has been completely redone as a tiled walk-in shower. Sheets for both beds, sofa sleeper and blow up matress. 2 pay machines located on each floor. Located in Building 3 - next door. Courts available for rent - bring your own equipment. Lots of restaurants. 2 grocery stores. Awesome shelling/dolphin excursion - (request more details if interested). Boat rentals from local marina. 20 minutes from Naples - lots to do there - zoo,shopping,restaurants,movie theater,etc. Beautiful view. Great beach, especially the shells! Nice comfortable condo. Pool heater not working. Tracy at the pool kept telling us all week they will be here today to fix it. BS !!! Last day we found out they have another pool that was warm. That would have been great to know earlier in the week. WiFi only at the pool or lobby. In the end it was still a great place to spend the week with my family. We thank you so much for sharing your place in paradise with us! Hope you had a great time other than pool. Still lots of glitches from Hurricane Irma to work through. WIFI is available in the unit - info located on box in bedroom. We stayed a week with the family. We especially loved the sunset from the balcony and short walk to the beach. The property was excellent. Just as advertised ! We had a great time in Chris' condo, and she was very responsive to the couple of things that I had to communicate during our stay. The condo itself is nicely appointed and comfortable. I did not read the description carefully, and my family did struggle a bit with the lack of wifi within the condo - I emphasize that this is disclosed in the description, but I might suggest thinking about installing wifi as an improvement. Everything was perfect!! Thank you so much!! This rate includes taxes & cleaning. Excess cleaning and/or laundry will be taken out of damage deposit.